Ok, when I heard about this, I thought to myself, no way. This can’t be any good. But to my surprise, it’s really pretty darn tasty! I will not be encouraging you to do it exactly the way I did, because I made some mistakes, and darn tootin’ I’ll be remedying those next time! Obviously this is more for the gluten-free than the paleo among us because of the prevalence of cheese, but I’ll be playing with more paleo options at a later date. As to the toppings, this is entirely up to you. You could use a simple tomato sauce, basil pesto, no sauce at all, any odds and ends you have lying around. Pre-cooked veggies and meats or veggies you prefer a little raw are best. We’d just had a meat and cheese fiesta up here in Wisconsin the other night, so we just pulled together our leftovers and started throwing them on top. I really liked the simplicity of the jamon serrano with arugula, truffle oil, and fresh pepper. But there was a terrific homey-ness to the goat salami with roasted mushrooms and green onion. Dried herbs (oregano, basil, Italian blend… whatever), 1 tsp. I grated the cauliflower by hand because of available tools, but if you have a food processor and like breaking it out, by all means, do so! I grated the entire head of cauliflower with the intention of making multiple batches. Once the cauliflower is shredded, grated, pulsed down to about rice size (hence the term “ricing”) put in a microwave safe bowl and pop into the microwave for 6 minutes. Careful not to over process if you’re using a machine. It won’t make it useless, but it’ll definitely have a different texture. If you’re opposed to using the nuker, I hear you. 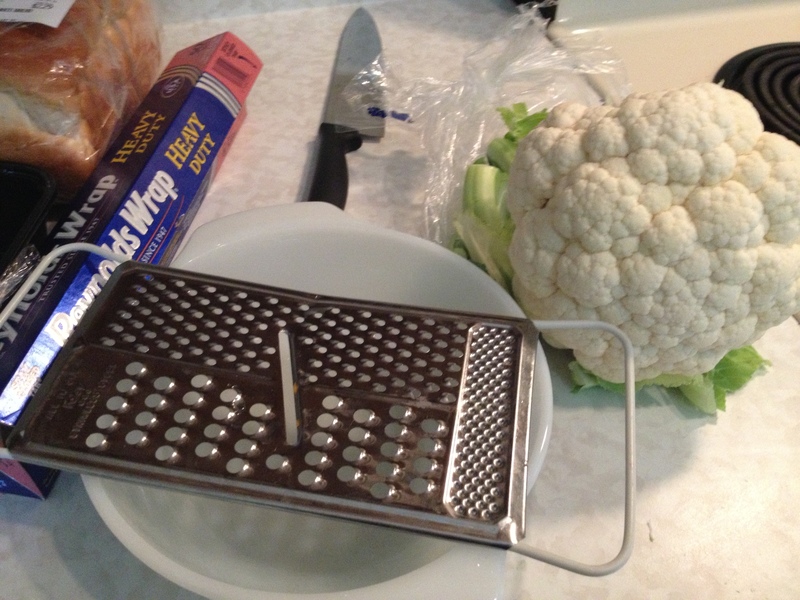 You can always steam the cauliflower first and then put in the processor, though it’ll be harder to grate by hand. Steaming afterwards is trickier business. I grated my own mozzarella by hand because I was recently reminded that almost all grocery store shredded cheese is coated with very fine cellulose (wood pulp) to keep it from sticking. Bleh. 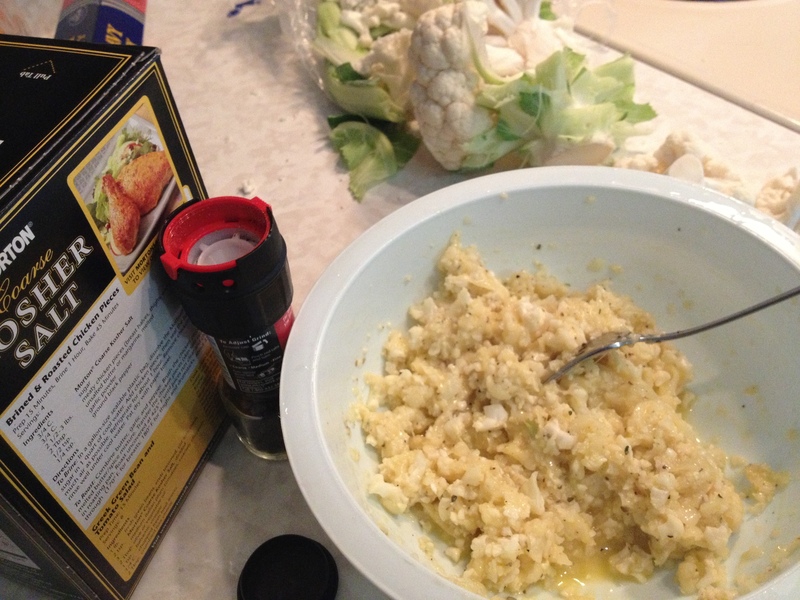 Mix together your cauliflower, cheese, egg, garlic, and herbs. 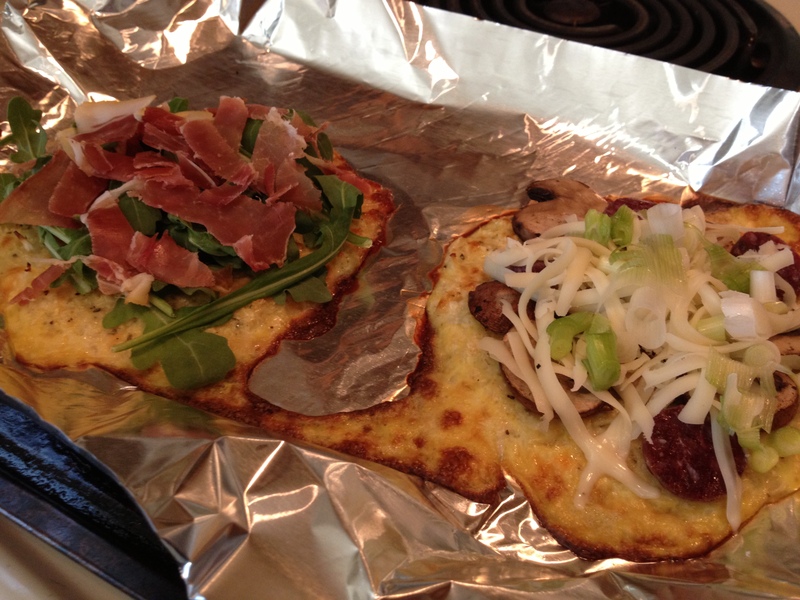 Drop onto your non-stick baking sheet and form into either one large round or two smaller ones (I opted for two. More topping options!!). You’ll want to press them them relatively flat. And don’t be a stooge like me! Don’t line the pan with foil. Use a non-stick pan and maybe even grease it up a bit! Pop into your preheated oven for 15 minutes or so. 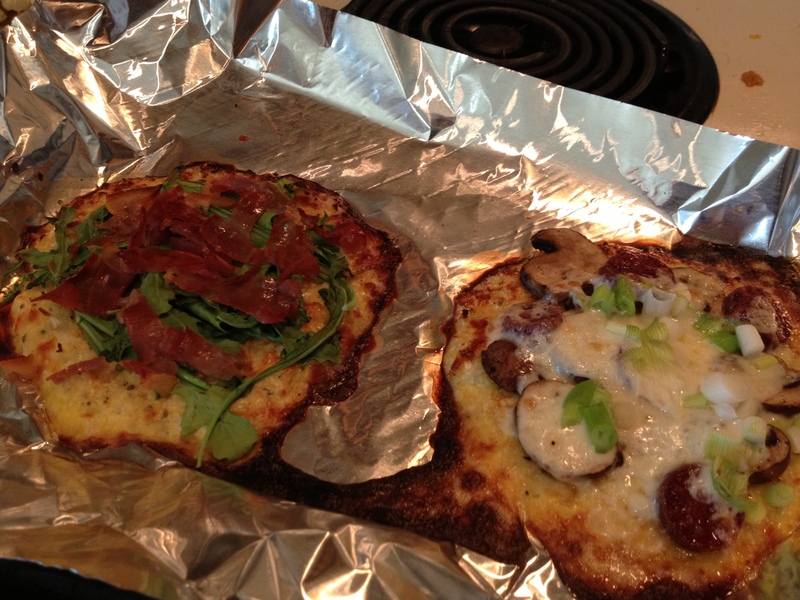 When the tops are browned a bit, remove from oven and add desired toppings. At this point, you could flip on the broiler or just put your pizzas back in the hot oven and let your toppings heat up/melt. I won’t pretend that this is like eating bready pizza, but I’ll tell you… for a pizza-like toppings delivery system, it’s pretty rockin’! Even my cauliflower hating gentleman friend dug it! Go out on a limb, try something new, my Amazons!